President Emmerson Mnangagwa and his Belarus counterpart Alexander Lukashenko at the Presidential Palace in Minsk. Mabasa Sasa — President Mnangagwa and his Belarusian counterpart Alexander Lukashenko yesterday sealed eight agreements, and also advanced a grand infrastructure scheme that could make Zimbabwe a regional transport and logistics hub. The eight agreements cover various aspects of education and training, science and technology, agriculture and legal issues such as extradition. Lands, Agriculture, Water, Climate and Rural Resettlement Minister Perrance Shiri -- who is the Acting Minister of Foreign Affairs and International Trade -- signed for Zimbabwe while representatives from Belarus put pen to paper on their country's behalf. The grandest of the plans is a road and rail network -- being formulated under a tripartite arrangement involving Zimbabwe, Belarus and China -- to link the Indian and Atlantic oceans, across Southern Africa and through Zimbabwe. After meeting President Lukashenko, President Mnangagwa said Zimbabwe would walk the talk on the agreements, adding he had invited the Belarussian leader to visit Harare at his earliest convenience to further consolidate the relationship. "This is how it should be between friendly countries," President Mnangagwa said. "Zimbabwe shall benefit immensely from the experience that Belarus has had. They have gone through similar challenges as we are presently going through. "It is the desire of my administration to widen and deepen our economic cooperation. There is no doubt in my mind that we shall walk the talk on the thing we are talking about here." 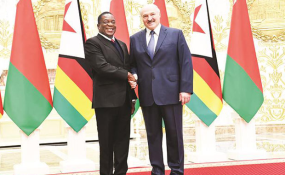 President Lukashenko said Belarus considered Zimbabwe an important and strategic partner in Africa, and he was ready, willing and able to support the country's economic development agenda. He added: "We are loyal and sincere friends and partners of Zimbabwe." After Zimbabwe's Head of State and Government addressed Belarussian business leaders in a meeting that followed the Presidential Palace Summit, Mr Sheiman said President Mnangagwa had managed to strengthen Harare-Minsk relationships. Mr Sheiman said, "We have unique opportunities to establish a very wide-ranging economic cooperation with Zimbabwe. Our economies are complementary. Zimbabwe is interested in Belarusian vehicles, such as trucks, tractors, utility vehicles, etc. "Zimbabwe is actively updating legislation to attract investment, to give a green light to joint ventures." Thereafter, he makes his way to Azerbaijan for talks with President President Ilham Aliyev, before rounding off the trip with a second appearance at the World Economic Forum in Switzerland.